Day 1 - Doi Suthep temple and handicrafts - This tour starts at 9am. You are picked up from your hotel by your guide. Drive down from Doi Suthep and have lunch. Afterwards visit some of the many handicraft villages in the Sankamphaeng area. As well as seeing products you will be able to see how they are made. Products include - celadon, silver, furniture, jewellery, lacquerware, silk, saa paper, handmade umbrellas and more. Plenty of opportunities for buying bargains and beautiful handmade products. Day 2 - Chiang Dao Elephant Camp - This tour starts at 8.30am. You are picked up from your hotel by your guide. Drive north of Chiang Mai to Chiang Dao (approx. 1hr) to the elephant camp. At the elephant camp you will see the elephants taking their morning bath and demonstrating some of their skills. Afterwards take an elephant ride for approx. 1½ hrs to a Lisu hilltribe village. The ride takes you through some of the lovely forest scenery and along the river. After lunch take a bamboo raft trip down the river for approx. 1 hr, admire the scenery and absorb the tranquility as you float down the river. Then drive back to Chiang Mai in the afternoon. This tour ends when you are taken back to your hotel at approx. 3pm. 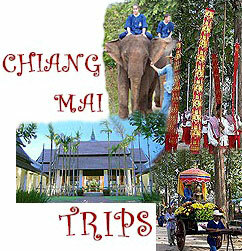 Day 3 - Chiang Rai & the Golden Triangle - This tour starts at 7.30am. You are picked up from your hotel by your guide. Drive north-east from Chiang Mai to Chiang Rai (approx. 180kms). On the way stop at the hot springs at Mae Kachan and then continue on to Chiang Rai. Tour around the town of Chiang Rai and continue driving to Chiang Saen (approx. 60kms). In Chiang Saen explore the old temples including Wat Pa Sak; also visit the museum. Then drive a bit further to Sop Ruak, this is the place where you can see the three countries of Thailand, Laos and Burma. Stop here briefly, then drive to Mae Sai. Mae Sai is a border town on the Thai-Burmese border. There is a market to browse around and look for Burmese products or some products which have been brought from China. After Mae Sai we start to head for Chiang Mai, visiting hilltribe villages on the way back to Chiang Mai. This tour ends when you are taken back to your hotel at approx. 8pm. Note: This is a private tour, lunches and entrance fees are included. This tour is a private trip to visit Doi Suthep Temple, handicraft centres, Chiang Dao elephant camp and the Golden Triangle area. 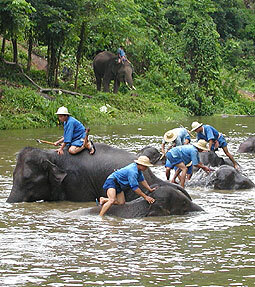 Varied sightseeing trips, including elephant riding and bamboo rafting. A good variety trip for the family - suitable for all ages. Pick up and drop off at your hotel.